Mario Cuenca Sandoval lives in Cordoba, where he is a Philosophy teacher. 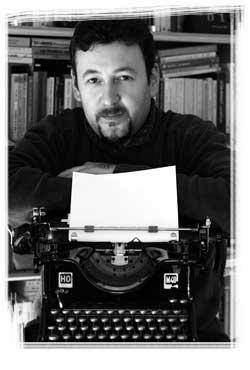 He has published the poetry collections Todos los miedos (Renacimiento, 2005 – Surcos Poetry Award), El libro de los hundidos (Visor, 2006 – Vicente Nuñez Poetry Award), and Guerra del fin de sueño (La Garúa, 2008). As a fiction writer, he is the author of the novels Boxeo sobre hielo (Berenice, 2007 – Andalucía Joven Narrative Fiction Award), El ladrón de morfina (451 Editores, 2010), and Los hemisferios (Seix Barral, 2014)unanimously acclaimed by the critics. His latest work is the long awaited novel El don de la fiebre (Seix Barral, Spring 2018), about the composer Olivier Messiaen.